As EUR is under pressure of German failure in coalition issue, USD will be supported by the core durable goods data and the FOMC minutes. The support rests at 1.17230 with resistance at 1.17550 which both lines are below the weekly pivot point at 1.17610. The EMA of 10 is moving with bearish bias in the descendant channel and it is above the EMA of 200 and the EMA of 100. The RSI is moving on the 50 level, the Stochastic is showing upward momentum and the MACD indicator is in neutral territory. The ADX is showing buy signals. 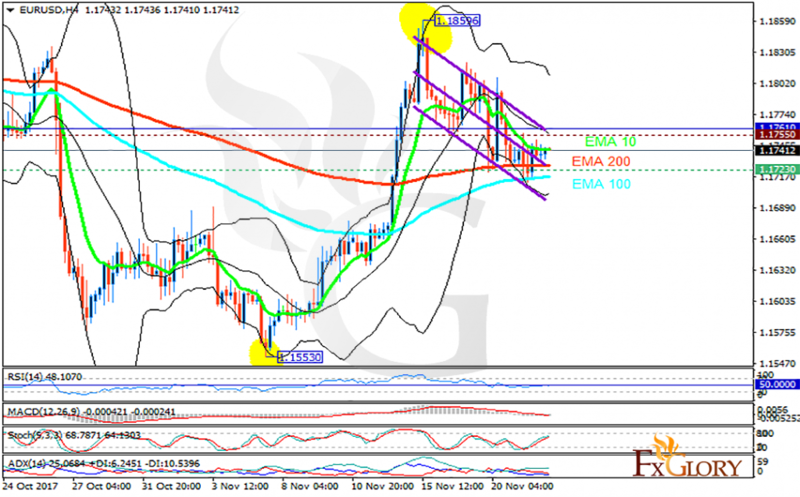 The price is moving in the lower Bollinger band, therefore, in case of price decline, sellers can target 1.16 otherwise EURUSD will grow to 1.18.